Water is very slowly removed from the soil related to water supply when the water remains at the soil surface for a long time if there are no artificial drainage. Soil of this drainage class is usually occupy level or depressed sites and frequently ponded. Where the rainfall is high and nearly continuous, very poorly drained soils may be found with moderate or high slope gradient. These soil are wet enough to prevent the growth or most important upland crops without artificial drainage. Soils of this class have aquic soil moisture regimes. Water is very slowly removed from the soil related to water supply when the soil remains wet for a long time. Free water is commonly at or near the surface during enough of the growing season that the most common upland field crops cannot be grown unless the soil is artificially drained. Poorly drained conditions are due to a high water table, a slowly permeable layer within the profile, seepage, nearly continuous rainfall or some combination or these conditions. Soil of this class usually has aquic soil moisture regimes. Water is removed from the soil slowly enough in relation to supply to keep the soil wet for a significant part of the growing season. Soil wetness restricts the growth of upland crops to a marked degree, unless artificial drainage has been provided, but upland crops can be grown in most years. Somewhat poorly drained soils commonly have a slowly permeable layer, a high water table, additions of water by seepage, nearly continuous rainfall or some combination of these. Some soil of this class has aquic soil moisture regimes while others do not. Water is removed from the soil somewhat slowly in relation to supply during some periods. The soil is wet for a small part of the growing season but long enough to periodically affect most upland crops. Moderately well drained soil commonly have a slowly permeable layer within or immediately beneath the soil, a relatively high water table of short duration, addition of water through seepage, high rainfall for some period or some combination of these conditions. Moderately well drained soils of grasslands commonly have thick dark “A” horizones and yellowish or grayish faintly mottled “B” horizons. Water is removed from soil readily but not rapidly. Water removal is in good balance with supply. 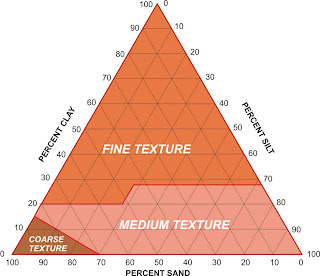 Well drained soils are commonly intermediate in texture although soils of other textural classes may also be well drained. Well drained soils are mottled only in the lower part of a thick “B” horizon, deep in the “C” horizons or due to the occurrence of fossil clay. These soils commonly retain near optimum amounts of irrigation water. Some have low water retention capacity, but receive rain frequently and are seldom dry. Water is removed from the soil rapidly in relation to supply. Some of the soils are shallow. Many of them have faint horizons and are sandy and very porous. Somewhat excessively drained soils are usually free of mottling throughout. Among soils of the grasslands, many somewhat excessively drained soils have either relatively thin “A” horizons or thick “A” horizons less strongly expressed than in well drained soils. Yields of most crops are usually low on soils of this class unless the soil is irrigated. The degree of variability varies with the mode of formation. Frequent river flooding events produce high variability in soil tectures over sa short distance. On the other hand, large alluvial basins may have very uniform texture and slopes. This rating gives a relative degree of variability only. 1. Low : uniform soils throughout the unit, high predictive value within the map unit. Uniform areas greater than 100 ha in size. 2. 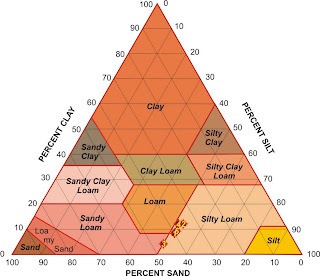 Moderate : considerable variability of soils due to texture and / or salinity changes. Uniform areas between 10 ha and 100 ha in size. 3. High : great variability of soils with regard to texture, salinity and moisture within a particular map unit. Difference not mappable because of intensity of survey. Uniform areas less than 10 ha in size. River flooding hazard was determined largely by examination f soil profile. Young surface sediments and buried soils indicate active river flooding. In populated areas the people’s experiences match closely the inferred flooding as shown by the soil profile. The rating correspond closely to the topographic position in relation to river level. 1. Low : rarely or never floods with river water (less than onnce in 10 years). This measures the degree of acidity or alkalinity within the soil profile. pH = - log (H+) à determined electrometrically in 1 : 2 of soil : KCl solution. A 0.01 ml KCl solution is used to minimize the effect of salts which tend to raise the pH of the solution above that which is actually experienced by plant roots. pH values in KCl solutions are often 1 unit lower than pH’s taken in soil by water solution. Soils for which the conductivity of saturation extract is more than 4 mmhos/cm at 250C and for which the ESP is less than 15. Ordinarily, the pH is less than 8.5. When adequate drainage is establish, the excessive soluble salts may be removed by leaching and soils again become normal. Owing to presence of excess salts and low ESP, saline soils are generally flocculated. Consequently, the permeability is equal to or higher than, similar nonsaline soils. These soils, formerly called saline / alkaline are those for which the conductivity of saturation extract is greater than 4 mmhos/cm at 250C and for which the ESP is greater than 15. pH levels seldom exceed 8.5. Saline / sodic soils occur in parts of the coastal plains. When excess salts are present, the appearance and properties of these soils are generally similar to those of saline soils. If the excess salts are leached, the properties may change markedly to resemble those of nonsaline/sodic soils. Upon leaching, the soil pH levels may exceed 8.5, the particles disperse and the soil becomes impermeable. The return of soluble salts may lower the pH reading and restore the particles to a flocculated condition but management of these soils continues to be difficult until excess salts and exchangeable sodium are removed. In some instances, saline / sodic soils contain gypsum. When these soils are leached, calcium dissolves and the replacement of exchangeable sodium by calcium occurs concurrently with removal of excess salts. These are soils for which the ESP is greater than 15 and the conductivity of saturation extract is lower than 4 mmhos/cm at 250C. pH readings usually at range between 8.5 and 10. Soils like this were encountered on the coastal plains, usually associated with saline/sodic soils. Soils may initially fit any of these categories and with irrigation and drainage they may remain the same or improved. However when drainage inadequate and/or irrigation water is of poor quality, soil deterioration often occurs. When soil water is derived from irrigation, the soil solution is at least as saline as the irrigation water and usually more so. Increases in salinity result from evapotranspiration and consumptive use of water by plants. Both of these concentrate salts in the residual soil water. Therefore, it is necessary to remove the concentrated soil solution from the root zone to prevent the salinity from reaching damaging levels. This can be accomplished if water applications exceed evapotranspiration and internal drainage is adequate. However, if drainage is not adequate, excess water raises the water table which causes water logging and also increases the movement of salts into the upper root zone. Infiltration rates of less than 0.25 cm/h or hydraulic conductivities of surface soil as low as 0.1 cm/h may present serious difficulties in leaching (USDA Handbook 60). When concentrations of soluble salts in groundwater exceed 100 ppm, water table depth becomes important and should be lower than 180 cm to 200 cm for medium textured soils and somewhat shallower for coarse and fine soils (Van Schilfgaarde, 1974). In some instances 2 or 3 milliequivalents of exchangeable sodium per 100 grams of soil is equal or even more useful as a critical limit (USDA Handbook 60). With the exception of paddy, all crops are adversely affected by deteriorating soil structure. However, stunted growth of rice occurs when ESP values are in the range of 20% to 40% (Van Schilfgaarde, 1974). The salinity of soils is determined by measuring the electrical conductivity of the saturated extract. The adverse affects on growth of crops when salt contents are increased are shown on table below. The bulk density is the mass of dry soil per bulk volume. It is recorded in units grams / cm3.